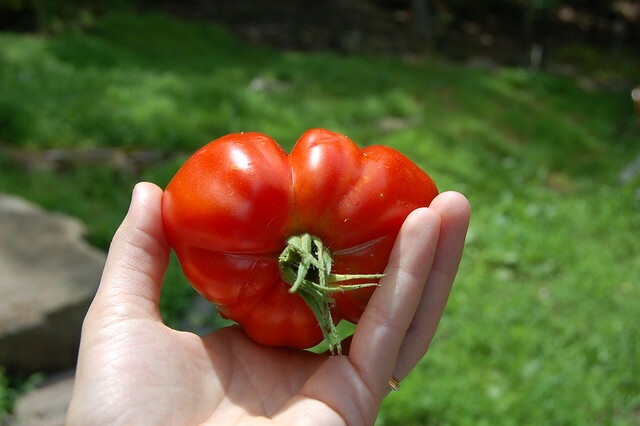 It seems that we've been lucky enough to dodge the blight bullet, judging by the beautiful tomatoes we've been receiving in our CSA box and that I see at all the local farmers markets. The eggplants my husband and I have been receiving from Eatwell in each produce box are also incredible -- even the big ones are very sweet and flavorful. 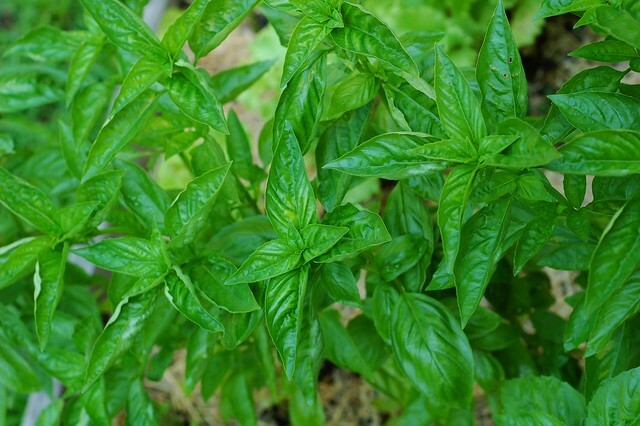 It's also been a good year for basil -- the sprigs we've received are tender and flavorful. These grilled stacks are a wonderful marriage of flavors. If you don't have a grill, you could also make them by roasting in the oven. Try to find the sweetest tomatoes you can! 1. Blend basil with oil and 1/2 teaspoon salt in blender until finely chopped. Pour into a paper-towel- or coffee-filter-lined sieve set over a bowl and let drain 20 minutes. Gather together sides of towel or filter and press gently on it to extract more oil. (You will have a generous 1/3 cup oil.) Reserve 1 tablespoon basil oil separately for serving. Scrape basil solids into a small bowl and reserve. 2. Prepare grill for cooking over medium-heat. While grill heats, cut off bottoms of eggplants, then cut 6 (1/2-inch-thick) crosswise rounds from each, starting from cut end. Reserve remaining eggplant for another use. Cut 4 (1/3-inch-thick) rounds from large tomato and 2 center slices (1/3 inch thick) from each medium tomato, reserving remaining tomato for another use. 4. 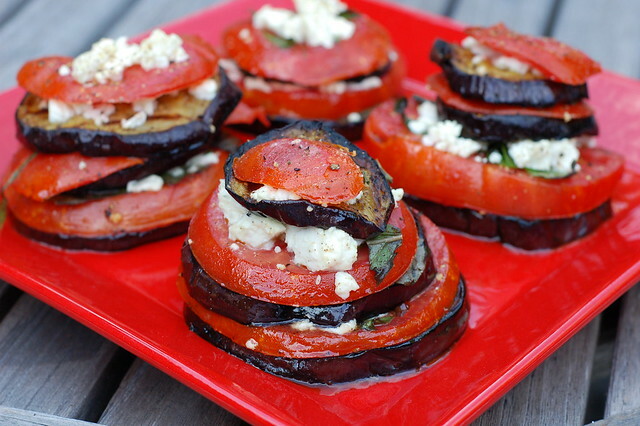 Make the stacks -- on a baking pan, arrange the 4 largest eggplant rounds side by side and spread each with a generous 1/2 teaspoon of reserved basil solids, then top each with 1 of the 4 largest tomato rounds. Season tomatoes with salt and pepper and top each with about 1 tablespoon feta. 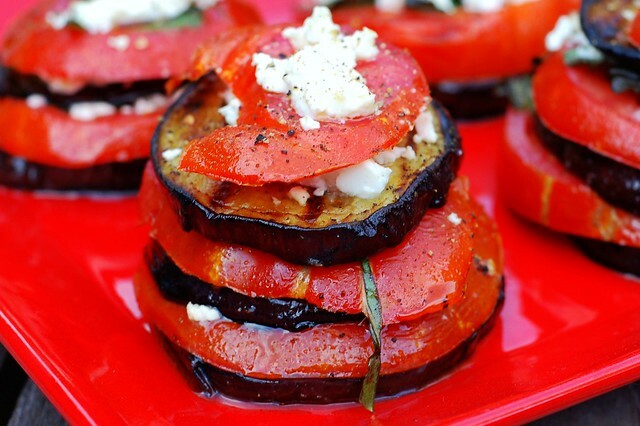 Make another layer with medium-size eggplant rounds, basil solids, medium tomato rounds, salt, pepper, and feta, then top with remaining eggplant and feta. 5. Set baking pan on grill and cook stacks, with grill cover closed, until heated through and cheese on top is softened, about 3 minutes. Transfer stacks to 4 plates and drizzle plates with reserved basil oil. Love the recipe. 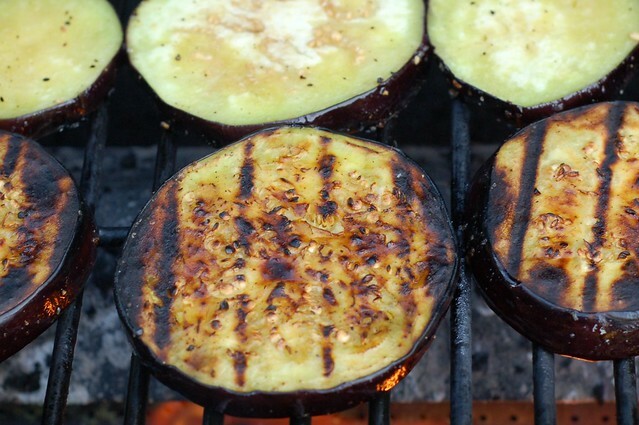 Eggplant is one of my favorite vegetables to grill. Got my first eggplant of the season in my Farm Fresh to You box and am going to Andronico's to get basil and feta to make this dish tonight. I have to figure out the best way to cook it without a grill!